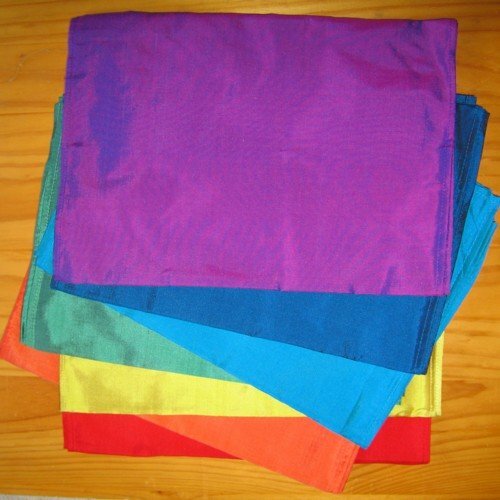 Colour therapy silk squares seven set are made from a lightweight, slightly shiny pure pongee silk. Each chakra square measures approximately 25x25cm or 10 by 10 inches. Each colour corresponds with each of the seven main chakras. Red corresponds with the base (root) chakra, orange with the sacral chakra, yellow with the solar plexus chakra, green with the heart chakra, pale blue with the throat chakra, indigo blue with the third eye chakra and violet purple with the crown chakra. 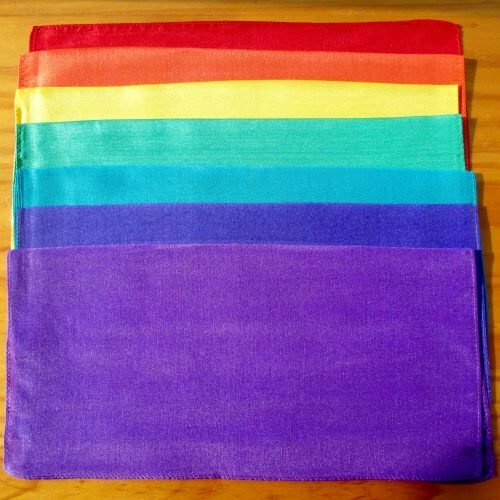 Clients can use the “colour therapy silk squares seven set” as a complete set. Lay each square in order, on the body or folded on the body. Also you can pick out one or more specific chakra colours to concentrate and work on. Another option, if you like working with crystals, is that you can also place your crystal on top of each silk. Therefore you decide what method works best for you. So, use the “colour therapy silk squares seven set” on their own or combine them with other methods and treatments. 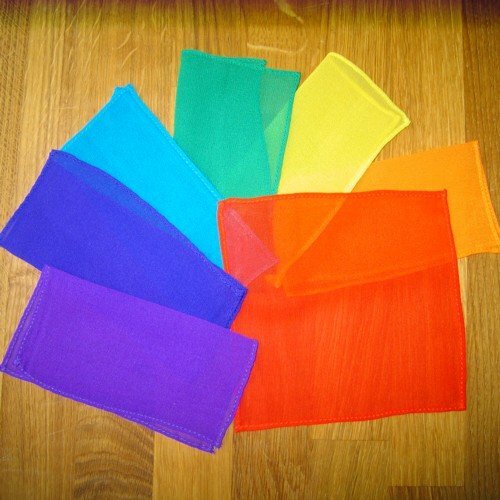 These chakra squares are great for use with singing bowls, reiki, colour therapy, crystal therapy, chakra treatments, hot stone therapy or many other holistic, alternative therapies or beauty treatments. Beside that, use in meditation or display as a focus point with your clients or with group work. 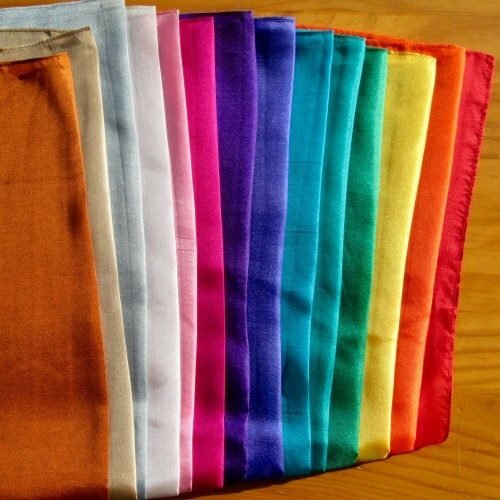 This “colour therapy silk squares seven set” was previously made with a fine chiffon silk. This set is now made with a light weight, slightly shiny pure pongee silk. In addition to the new type of pure silk, I’ve changed the orange to a richer, true mandarin orange colour and also the red is a deeper, stronger colour. Importantly clients love the new improvements and this continues to be my best selling “colour therapy silk squares seven set”. Enjoy! See the “care for your silks” page for washing instructions. Work in groups? please see the “trade orders” page, for reduced bulk purchase prices.